Over $750 million has been spent in recent fiscal years with large businesses to perform on contracts that are of a size and scope that exceeds the capabilities of a small business to perform. 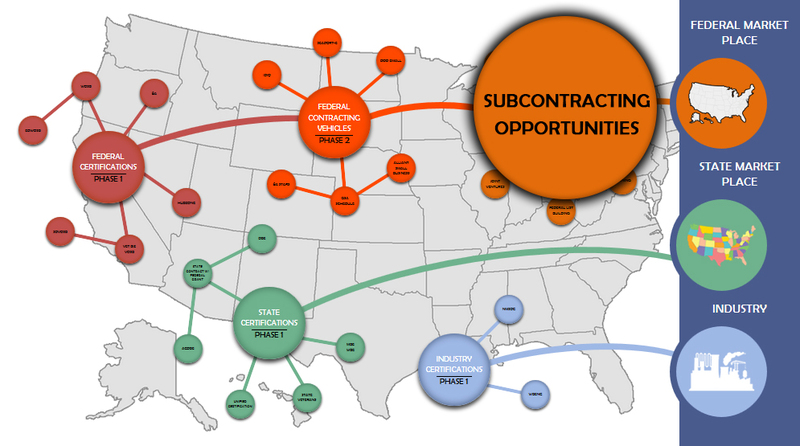 Federal contracts that exceed $650,000.00 ($1 million for construction), almost always direct that at least 23% of the total contract be sub-contracted to small businesses. Very often individual targets are included to direct work to 8a Program companies; or other Federal socio-economic programs with targeted spend. Typically the portion directed to 8a companies exceeds 5% of the total contract value. Specific to your geographic service support area, we will register your business with the top 30 Federal contractors (based upon the total amount of Federal contracts that have been won by the company in the last 2 years). We collaborate with clients to finalize the list of candidates. The registrations are usually performed on-line and via company unique registration procedures. Note: This is heavy data entry function which is done manually. The post registration report will list which companies you have been registered to do business with (and, as applicable) will contain your company’s user name and password information. It will also include the contact details for the company’s small business development/coordination office as well the names of the Federal Agencies/Site Offices that they are currently or have recently supported and contract information specific to the two recent awards.The details we require as needed to perform the registrations include copy(s) of your capability statement(s) as well as some additional information not publically available in SAM.